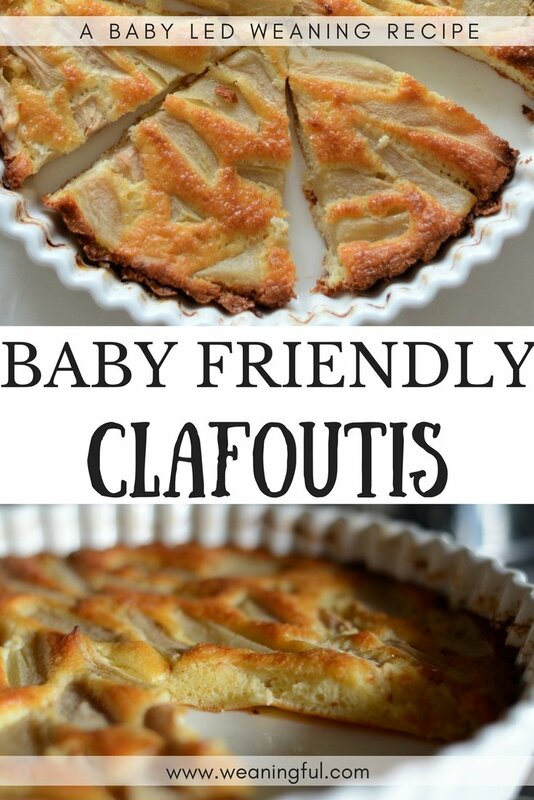 Clafoutis is basically the French term for a thin sponge cake, similar to a waffle in consistency or a thicker pancake, if you wish. The French make it sound so posh, n’est-ce pas? It involves some fruit, whichever is in season, on top of which you pour a thick batter and which gets baked in a butter lined pan, form or oven-proof dish. It couldn’t be any simpler than that. But the French word sometimes puts people off, imagining it’s some sort of fancy dessert only reserved for the royals. Now, some recipes involve also a third step: covering with powdered sugar after it cools off. For obvious reasons, we will leave that part out of the recipe. Babies do not need any of that. 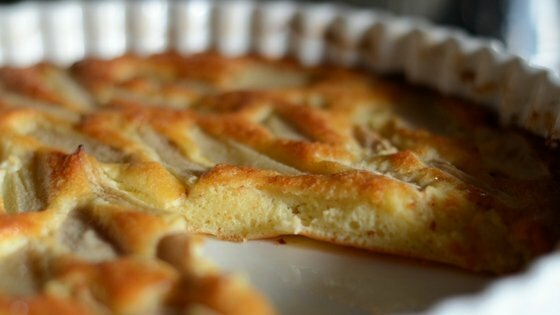 So why should I make this clafoutis recipe? 1. It’s easy. Takes about 10-15 minutes to prepare if you have everything you need. Which brings me to number 2. 2. You can make it with ingredients you probably have already in your pantry and fridge. Butter, eggs, flour, sour cream (or yogurt if you ran out of) and any fruit you have around and sits well on a batter. 3. It’s a great finger food. I should have included it in my list of 125 first foods for babies without teeth. It’s moist and soft and babies can easily pick it up and chew. 4. It has all the main food groups covered. Protein, dairy, cereal (the flour), fruit and fat. 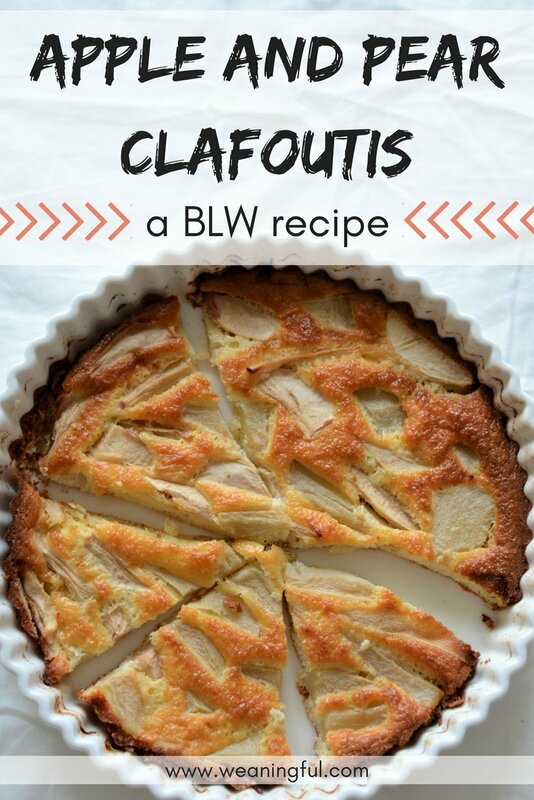 Kudos for clafoutis! 5. It can make a great breakfast, snack, dessert, on-the-go meal, it’s lunch box friendly too! Basically you can serve it anytime you want! 6. No sugar added. And that includes no maple syrup, as I frequently see in “baby friendly” desserts out there. 7. It’s great for baby led weaning. Great for the whole family too! I guarantee you will lick your fingers. 8. It’s so versatile. You can put any fruit in it, anything that goes well baked in the oven, that is. 9. It’s quick to bake. If you’re tired of making muffins, then this bakes in the same number of minutes. 10. Keeps well in the fridge. That’s breakfast sorted for Monday, Tuesday, Wednesday… if it lasts that long without being eaten! All this being said, read on for the ingredients, quantities and how to prepare. I would appreciate it if you would share this on social media if you like the recipe. Sharing is caring, even more so for us, busy moms! 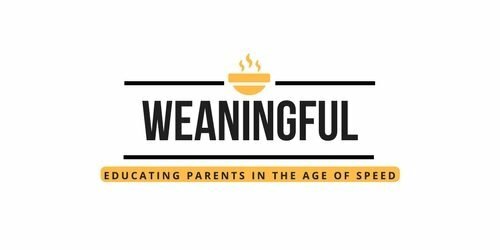 If you are struggling with weaning and introducing first foods, then my FREE ebook might help with that. If you want to know what are the top first foods babies can’t say no to, then join me in learning how to vary these foods quickly and easily, with accessible ingredients, in 15 minutes or less! 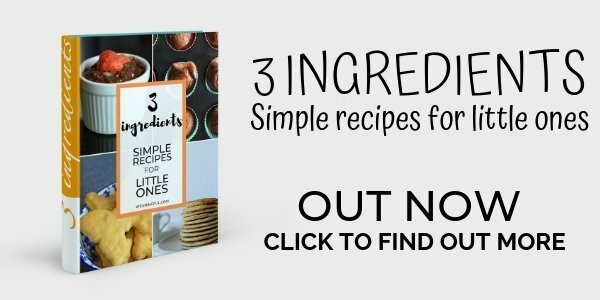 Brilliant finger food recipe, even for babies with no teeth. 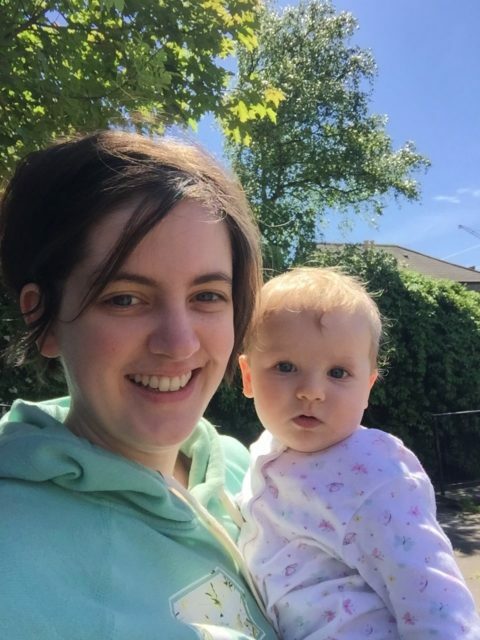 Baby led weaning friendly and quick, great finger food for picky eaters, this baby led weaning recipe for 6 months+ is guaranteed to give your little one a boost each day! Melt the butter. Use a little bit of it to grease your pan/form of choice. Mine had 26cm (10 inches) in diameter. In a bowl, mix the eggs with the sour cream/yogurt. Add the melted butter and flour to the mix. Pour all the batter into your pan and top with pieces of fruit. Bake for 20-25 min at 200 C (400 F or Gas 6) until it browns on top. Leave to cool completely. Told you it was simple!